L. Sachs, The Adventures of a Biologist: Prenatal Diagnosis, Hematopoiesis, Leukemia, Carcinogenesis, and Tumor Suppression. M. Feldman, From Aristotle, through Spemann, to Tumor Immunology: A Personal Experience. M.A. Ozbun and J.S. Butel, Tumor Suppressor p53 Mutations and Breast Cancer: A Critical Analysis. G. Selivanova and K.G. Wiman, p53: A Cell Cycle Regulator Activated by DNA Damage. J. Pines, Cyclins and Cyclin-Dependent Kinases: Theme and Variations. E. Canaani, P.C. Nowell, and C.M. Croce, Molecular Genetics of 11q23 Chromosome Translocations. P.J. Polverini and B.J. Nickoloff, Role of Scatter Factor and the c-Met Protooncogene in the Pathogenesis of AIDS-Associated Kaposis Sarcoma. S. Miyamoto and I.M. Verma, REL/NF-(B/1(B Story. E. Yefenof and M. Kotler, Radiation Leukemia Virus-Induced Leukemogenesis: A Paradigm of Preleukemia and Its Control by Preventive Therapy. W. Doerfler, The Insertion of Foreign DNA into Mammalian Genomes and Its Consequences: A Concept in Oncogenesis. References. Subject Index. ADVANCES IN CANCER RESEARCH is a biannual publication that includes timely reviews on the most cutting-edge issues in cancer research. Volume 66 contains encompassing overviews of p53 and its role in both breast cancer and in the cell cycle. Approximately 50% of all human tumors involve mutations of the p53 gene, suggesting that proper understanding of its properties and mechanisms could offer real hope for finding successful clinical therapy. Other themes presented in Volume 66 include cyclins and cyclin-dependent kinases in the cell cycle. Approximately 50% of all human tumors involve mutations of the p53 gene, suggesting that proper understanding of its properties and mechanisms could offer real hope for finding sucessful clinical therapy. 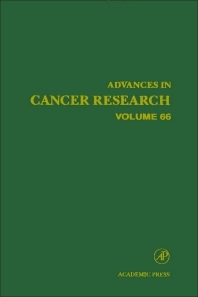 Other themes presented in Volume 66 include cyclins and cyclin-dependant kinases in the cell cycle: the molecular genetics of 11q23 chromosome translocations: the possible link between the aberrant expression of Scatter Factor and c-Met with AIDS Associated kaposi's Sarcoma, the use of Radiation Leukemia Virus to induce leukemogenesis, and the Adenovirus system as a model for the insertion of foreign DNA into mammalian genomes. Also of note in the "Foundations of cancer Research" section are articles by two prominent cancer researchers recollecting the ideas and paths taken in their lifelong work. Paradigms proposed in these reviews mark thoughtful progress toward preventative therapy in oncogenesis and gene therapy of cancer. They also cast light on the fact that the ideas presented in these chapters are only the tip of the iceburg in this complex and ever evolving field, and suggest many more to come in future volumes.